Sorry for the delay while I was getting my bearings in Egypt, but I'm back! 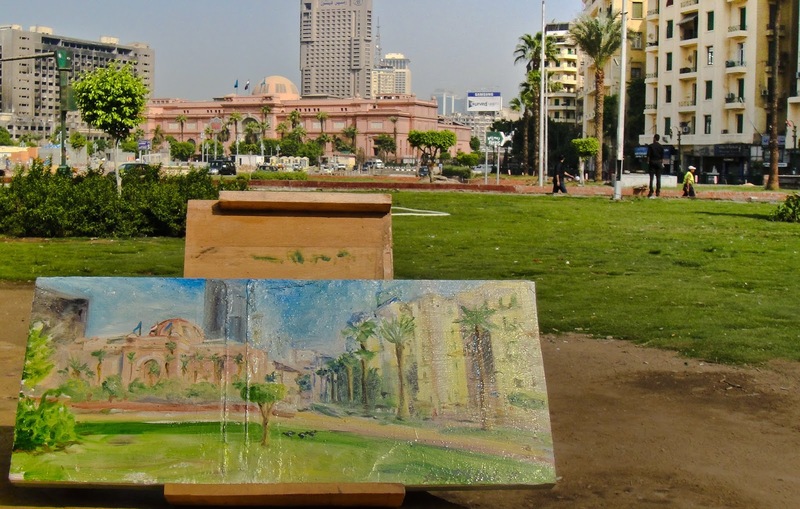 I have finally left my first Lost Art painting in Cairo, and what better place to start than Tahrir Square? I was warned multiple times not to come here on my own as a woman, and not to attract attention to myself in the square, but I finally decided (with the help of some friends) to make a plan to come over here very early on a Friday morning (when there's almost nobody downtown) and try my best to find myself a tranquil view of the place. As it turns out, hardly anyone noticed me except for Mai Mahmoud, a journalist from AlMasry AlYoum who filmed this short interview with me while I was painting it! :). It was a lovely, peaceful morning, and the light fell gently for me on the park and on the Egyptian Museum. And now that I know my way around a little better, I look forward to losing a lot more art in this town over the weeks to come! This painting, oil on found wood, roughly 48 cm x 37 cm, was left on Tahrir Square, Cairo on September 26th, 2014 at 4pm.